As we grow older, there are many systems in our bodies that start to deteriorate. Such include our levels of energy, resistances to sicknesses, and general mental fortitude and stability. Eating healthier, and watching what we eat is key to maintaining our bodies and the ensuring that we are mentally and emotionally strong. The best foods are made up of fresh, wholesome ingredients, but all remaining delicious at the same time. Fruit – Fruit is sweet and delicious, and we should all have at least 2-3 servings a day. Try new fruits! Veggies – 2-3 cups of vegetables are a good addition to any diet. Leafy greens like spinach and broccoli are great options, along with squash and other veggies. Calcium (Dairy) – Calcium is essential to maintaining the health of our bones as we age. Higher calcium intakes ensure less bone fractures and other bone related health concerns (osteoporosis). 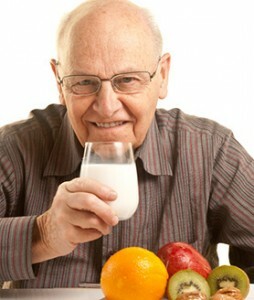 Seniors should look to have at least 1200 mg of calcium a day. Some examples of calcium rich foods include dairy products like milk and yogurt. Fats – Be careful of what types of fats you are eating. Saturated fats are a way better choice than trans fats. Look out for these on the nutritional information on the food products you buy. What can having a healthy diet do for you? Before you start to suddenly change your diet, It is important to consult your doctor or dietitian, because they will know your health best, and recommend foods to eat/not eat based on any conditions you may have. That’s not to say you can’t change your lifestyle today – being healthy makes you have a better and more positive outlook in future years.